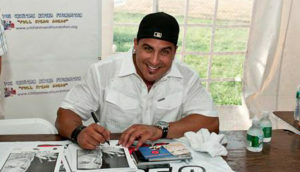 July 17 was a star-studded day at The Country Fair Entertainment Park in Medford, NY. That was the site of Mega Jam 2010, the all-day event offering carnival rides, food, family fun and music. Party 105.3 FM put on the event, which was hosted by Miranda Cosgrove, star of Nickelodeon’s iCarly, and Kiowa Gordon, best known as Embry Call in the Twilight series. JWoWW from MTV’s Jersey Shore was seen there with some of her castmates and musicians Lucas Prata, Natasha Bedingfield, Shaggy, Kelis, Jay Sean and many others could be spotted rocking the stage. The most exciting presence at Mega Jam 2010, however, had to be the Cristian Rivera Foundation. The event helped raise awareness about the Foundation, and many of the celebrities on hand stopped to take their picture in front of a Foundation-branded step and repeat. The Foundation gave out t-shirts and wristbands. Miranda Cosgrove wore a signature Foundation wristband. Party 105.3 on-air talent DJ Serg and Party 105.3 owner and Cristian Rivera Foundation Committee Member Vic Latino not only wore the wristband, but a Foundation t-shirt too.